Björk doesn’t like to think about her legacy. "I try not to. It can paralyze you. It unplugs you," she says, "with your gut." It’s fitting, then, that after selling 3.1 million U.S. copies of her first six solo albums (according to Nielsen SoundScan), the Icelandic musician is ready to move beyond the CD, and even the MP3, and peer into the future. "I’ve always been aware that vinyl or CDs are not the only way [to release music]," says Björk, 45. "Both are very short-lived formats if you look at how long music has been around. There are always going to be people who listen to music and always going to be people who want to play it for them. That will never change." "Biophilia", due Sept. 27, isn’t a new album as much as a new experience : The 10-track set will be released as an iPad app suite that invites the listener to tinker with its sonic palette through touch-screen technology. Björk and a team of developers designed the apps to plunge the listener into the album’s cosmology theme. The suite is stacked with interactive games, visuals and musical tools. "The spectrum is from ’music video’ to ’instrument,’ and generally all the apps are fitting somewhere in between that, sometimes in multiple places," says media artist Scott Snibbe, who served as one of the chief developers on the project. For those who don’t own Apple’s tablet computer, "Biophilia" will exist as a gargantuan live show that features one-of-a-kind instruments, an educational program that teaches abstract musicology to kids, a 90-minute documentary that captures the making of the project and a relaunched website-the design mirrors the experience of the apps. "Biophilia" will also be released on CD through Nonesuch/One Little Indian, and first single "Crystalline" has be pushed to radio before the premiere of its breathtaking music video. At the center of it all, of course, is Björk, whose cavernous, emotionally stirring follow-up to 2007’s "Volta" is her most immediate album since 2001’s "Vespertine." "This project is led first and foremost by Björk’s music," says Michele Anthony, Björk’s co-manager with Derek Birkett and former president of Sony Music. "The apps and the live show are just different mediums of expressing the heart of the project." Before "Biophilia" came to fruition, Björk was working on new music in a Puerto Rico beach house with engineer Damian Taylor, writing songs on pre-iPad touch-screens and forging new sounds with organ pipes that they had bought on eBay. After an extensive 18-month tour for "Volta," which included 10 U.S. shows that grossed a combined $3.5 million (according to Billboard Boxscore), Björk was ready to experiment. "We were making pendulums with elastics, rope, magnets and buckets . . . we were building something from the ground up," she says. The album was originally conceived as a 3-D movie to be helmed by longtime collaborator Michel Gondry, but around the same time the director bowed out to finish "The Green Hornet" last year, Björk had become fascinated with the capabilities of the recently released iPad. Björk reached out to a collection of her favorite app developers through email and presented them with a unique financial opportunity : Without a major label attached to her next project, the apps would be self-funded and the developers would reap the majority of the revenue. "Björk did it in a different way, which is that she said, ’What we can offer you guys is a creative partnership. Let’s equally invest,’" Snibbe says. "She has the freedom to decide how to distribute it . . . and that’s part of why this project could happen." Sometimes Björk would email the developers (who also included iPad luminaries like Max Weisel and Theo Gray) hundreds of times per day after the project was started last June. Other times, the team would meet up at locations like an abandoned lighthouse in Iceland and work for eight hours straight. Her goal was to ensure the developers used the 10 individual apps for each album track to showcase the natural elements at the heart of the songs. "Virus," a song about parasitic interaction in which Björk coos, "Like a virus needs a body . . . someday I’ll find you," is supported by an app that lets users fight off green parasites from healthy purple cells that each emit unique ringing sounds. In the game for the song "Crystalline," which is about shifting natural structures, players can navigate through neon-colored tunnels by physically swinging the iPad around, and collect different crystals that change the musical structure of the song mix. "I didn’t want the connection between the song and the app to be superficial," Björk says. "It had to go to the core." Along with the interactive games, all of the apps will feature traditional and animated scores that behave like gorgeously designed karaoke scrolls, as well as an academic essay about each song written by musicologist Nikki Dibben. The 10 apps are housed in a "mother app," a menu designed as a 3-D universe that lets the user navigate among the apps. Apps can be purchased individually-the "Crystalline" app costs $1.99-or as a buy-all, with pricing to be determined. When it came to approaching Apple to use its product as a host of the apps, Björk says the iPad was chosen simply because it could handle her ambitious creative plans, and that neither a monetary nor an exclusivity deal is in place between her team and Apple. If another tablet platform is created with the same capabilities as the iPad, Snibbe says, "Biophilia" could possibly be translated to that new platform. According to Apple sales reports through first-quarter 2011, the company has sold 14.7 million iPads worldwide since the device’s launch in April 2010. And while "Biophilia" will primarily exist on a platform that isn’t yet a household product-the 10 apps will also be available in scaled-down versions on the iPhone and iPod touch-Snibbe believes the iPad represents the starting point of a new creative outlet for artists. "This is like the birth of cinema," he says. "I know artists want to embrace it, and if the record companies can find a way to make this work financially and contractually for the artists, I think it will really thrive." Björk signed to Nonesuch Records, which handled the release of her 2009 live album "Voltaic," for distribution in North America earlier this year, in conjunction with longtime indie label One Little Indian. As the new album’s release date approaches, the label’s goal will be to promote the far-reaching resources of "Biophilia" without bewildering casual Björk fans. "Her audience has come to expect the unconventional from her," Nonesuch senior VP of marketing Peter Clancy says. 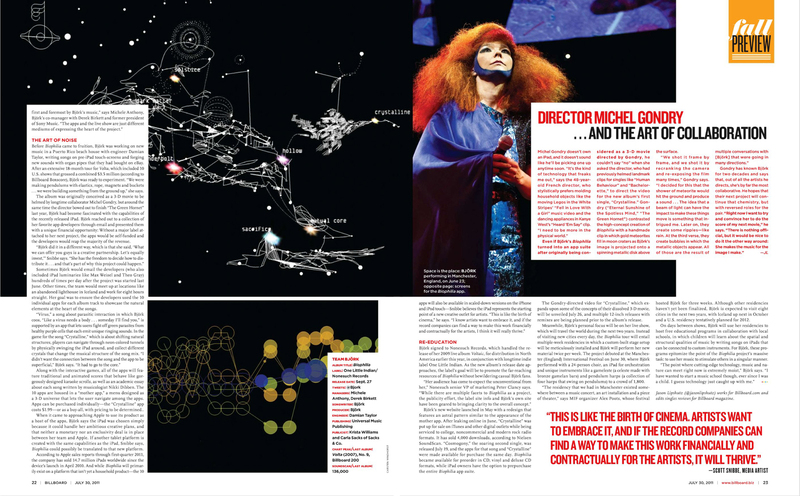 "While there are multiple facets to "Biophilia" as a project, the publicity effort, the label site info and Björk’s own site have been geared to bringing clarity to the overall concept." Björk’s new website launched in May with a redesign that features an astral pattern similar to the appearance of the mother app. After leaking online in June, "Crystalline" was put up for sale on iTunes and other digital outlets while being serviced to college, noncommercial and modern rock radio formats. It has sold 4,000 downloads, according to Nielsen SoundScan. "Cosmogony," the soaring second single, was released July 19, and the apps for that song and "Crystalline" were made available for purchase the same day. "Biophilia" became available for preorder in CD, vinyl and deluxe CD formats, while iPad owners have the option to prepurchase the entire "Biophilia" app suite. The Gondry-directed video for "Crystalline," which expands upon some of the concepts of their dissolved 3-D movie, will be unveiled July 26, and multiple 12-inch releases with remixes are being planned prior to the album’s release. Meanwhile, Björk’s personal focus will be on her live show, which will travel the world during the next two years. Instead of visiting new cities every day, the "Biophilia" tour will entail multiple-week residencies in which a custom-built stage setup will be meticulously installed and Björk will perform her new material twice per week. The project debuted at the Manchester (England) International Festival on June 30, where Björk performed with a 24-person choir, an iPad for orchestration and unique instruments like a gameleste (a celeste made with bronze gamelan bars) and pendulum harps (a collection of four harps that swing on pendulums) to a crowd of 1,800. "The residency that we had in Manchester existed somewhere between a music concert, an art installation and a piece of theater," says MIF organizer Alex Poots, whose festival hosted Björk for three weeks. Although other residencies haven’t yet been finalized, Björk is expected to visit eight cities in the next two years, with Iceland up next in October and a U.S. residency tentatively planned for 2012. On days between shows, Björk will use her residencies to host free educational programs in collaboration with local schools, in which children will learn about the spatial and structural qualities of music by writing songs on iPads that can be connected to custom instruments. For Björk, these programs epitomize the point of the "Biophilia" project’s massive task : to use her music to stimulate others in a singular manner. "The point where cutting-edge technology, music and nature can meet right now is extremely moist," Björk says. "I have wanted to start a music school though, ever since I was a child. I guess technology just caught up with me."